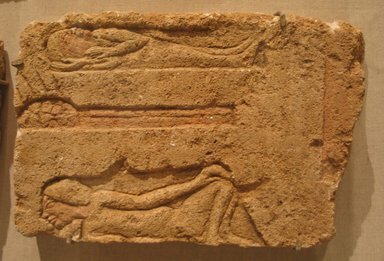 Whitish discolored limestone slab, with two reclining male figures in sunk relief, one above the other; between them an oblong object, with fire at left end. Vertical line on right. Original edge preserved above, left and bottom; right edge broken. Traces of red color on men's faces, oblong object and vertical cut. Condition: Edges rough; nose of upper man chipped, whole surface discolored yellow brown.